One of the most engaging ways to learn about the past is through artifacts. In the same way that “a picture is worth a thousand words,” artifacts give us a visual glimpse into the life and culture of the past. They also tell us a lot about what was important to the people who came before us — you probably know from your own experience that you are more likely to save an item if it is associated with a significant event in your life, or has a meaningful memories attached to it. Therefore, just as objects can tell the story of an individual, they can also tell the story of our shared history and culture. 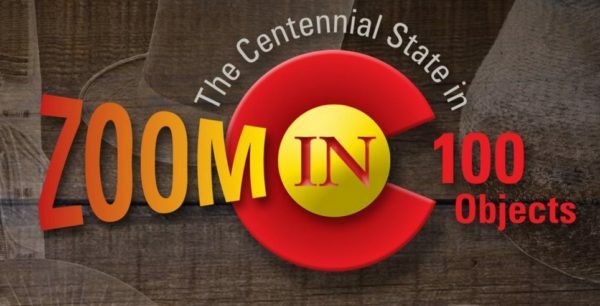 With this in mind, History Colorado has created an engaging exhibit, Zoom In: The Centennial State in 100 Objects. Arranged chronologically, the artifacts chosen for the exhibit include objects associated with significant people and events in the state’s history. In conjunction with the exhibit, each new issue of Colorado Heritage magazine profiles one of the objects in-depth. The current issue tells the heartwarming story of a Depression-era farmer’s remarkable Christmas gift to his young sons. Last fall’s issue examines the state’s election history with an 1884 ballot box, and the summer 2018 issue looks at Colorado’s early license plates. Finally, a general overview of the exhibit can be found in the Winter 2017/18 issue. Check out other issues of Colorado Heritage and its predecessor, Colorado Magazine, for more stories about the amazing artifacts in History Colorado’s collection. Issues back to 2014 can be viewed online from our library; older issues are available in print.